This post is sponsored by North by South Apparel. All opinions are 100% my own. Today I am introducing the pocket tie t-shirt! I’m sure many of you like to wear comfy clothes whenever you get the chance. I know I do. 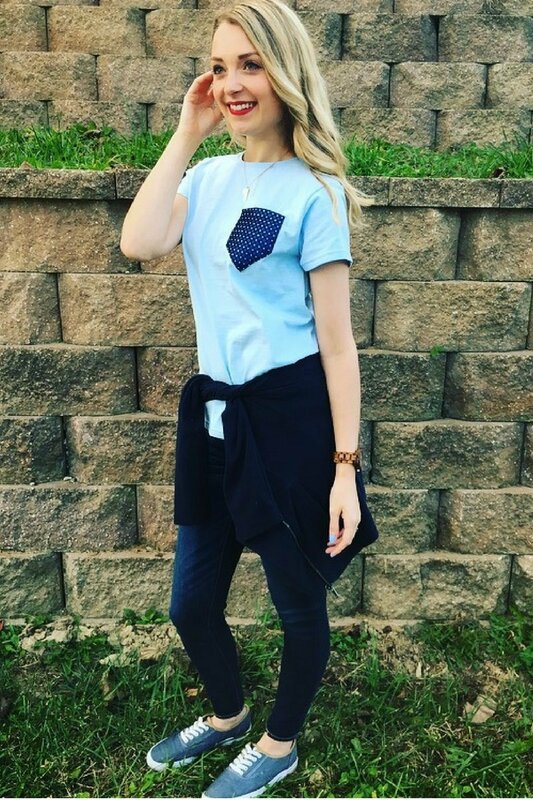 🙂 North by South Apparel creates the cutest, customized “shirt and ties” to match your lifestyle and also allows you to express your own personal style. They merge t-shirts (the preferred casual style of today) with a chest pocket that is custom made from neckties. So now you can throw on a t-shirt with that extra bit of confidence and still feel completely comfortable. North by South Apparel also offers plenty of color and design combinations! I finally picked out this navy colored pocket tie t-shirt with “The Bermuda” pocket. The colors really complement each other. Their website is very helpful, because it allows you to preview each pocket design with your choice of t-shirt color. 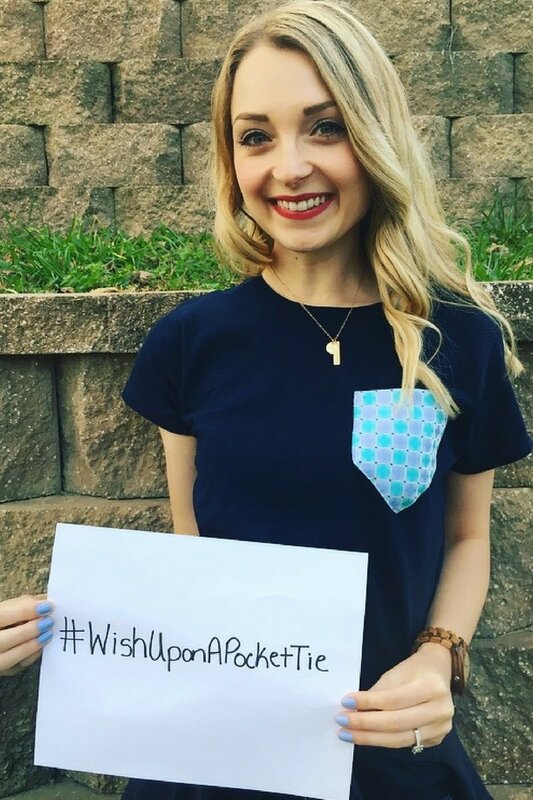 I also picked out their powder colored pocket tie t-shirt with the “The Wish” pocket. I went for the opposite color scheme from my first t-shirt, and I love how this one looks as well. Finally, I have my favorite reason to recommend North by South Apparel to all of you. Their brand means a lot more than business to them. They have partnered with Make a Wish® Central & Western North Carolina to donate a percentage of their sales so that more wishes can be granted. To learn more about this partnership, click here. This is the reason I am holding a sign that says “#WishUponAPocketTie”. The point of the hashtag is to spread the word about their partnership. I am also very happy to be able to give all of you a special discount code to use on their website! Use the code WISH to get 20% off your order! 🙂 So make sure to check out their website, and get your own pocket tie t-shirt. 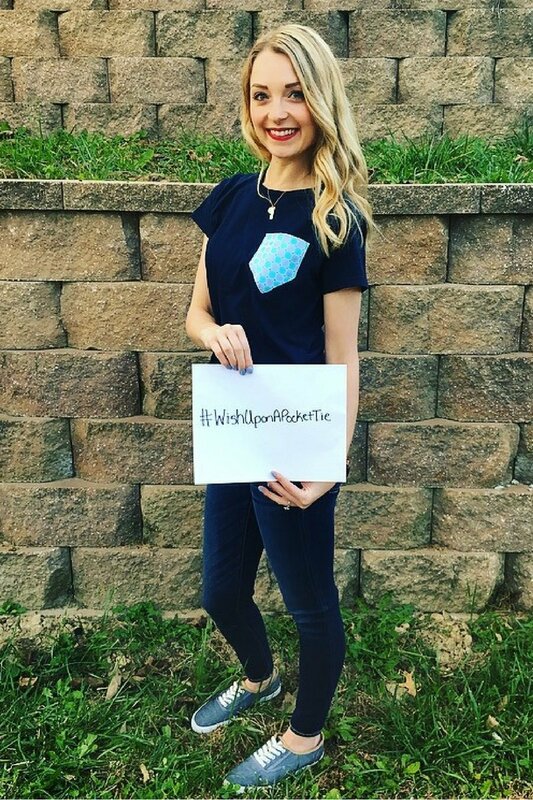 Once you get your t-shirt, post to social media with the hashtag #WishUponAPocketTie to spread the word about this campaign. 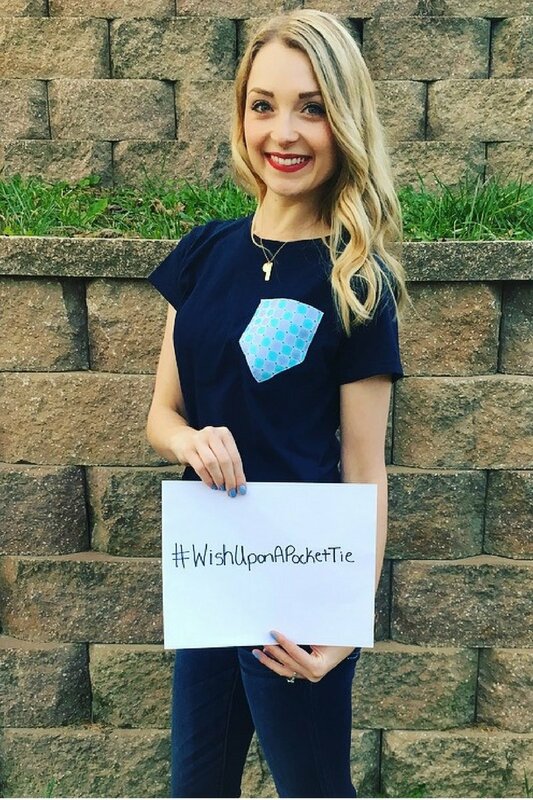 Let’s all get some cute t-shirts and help make children’s wishes come true! This entry was posted in Fashion and tagged cute t-shirt, good cause, Make a Wish Foundation, North by South Apparel, pocket tie t-shirt, shirt and tie, t-shirt.